We are thrilled to announce that Lucasfilm and the StarWars.com team have once again won several Webby Awards! The crew of The Star Wars Show, which recently returned from four uproarious days of live coverage of Star Wars Celebration Chicago, claimed both the Webby Award and the People’s Voice Award in Social: Television & Film as well as the Webby Award for Video: Variety. Our Live From the Red Carpet of Solo: A Star Wars Story! coverage nabbed the People’s Voice Winner in Video: Events & Live streams. And for the third year in a row, StarWars.com won the People’s Voice Award for Website in the Movie & Film category. It’s a distinct honor to receive so many People’s Voice prizes since this award is voted on by you, the fans! The team behind StarWars.com was also humbled to be named as an honoree in the category of Websites: Best User Experience. Over 23 years, the Webby Awards have become the leading international award honoring excellence online, with prizes chosen by a group of over 2,000 judges through the International Academy of Digital Arts and Sciences, and a second winner designated by popular vote. Thank you to the fans who cast their votes and have shown support for StarWars.com and The Star Wars Show each and every day by visiting, viewing, reading, commenting, and sharing in the experience of being Star Wars fan right along with us. We are honored. May the Force be with you. Vote Today in the Star Wars Fan Awards 2018! It’s the final day to cast your ballots in the Star Wars Fan Awards 2018. 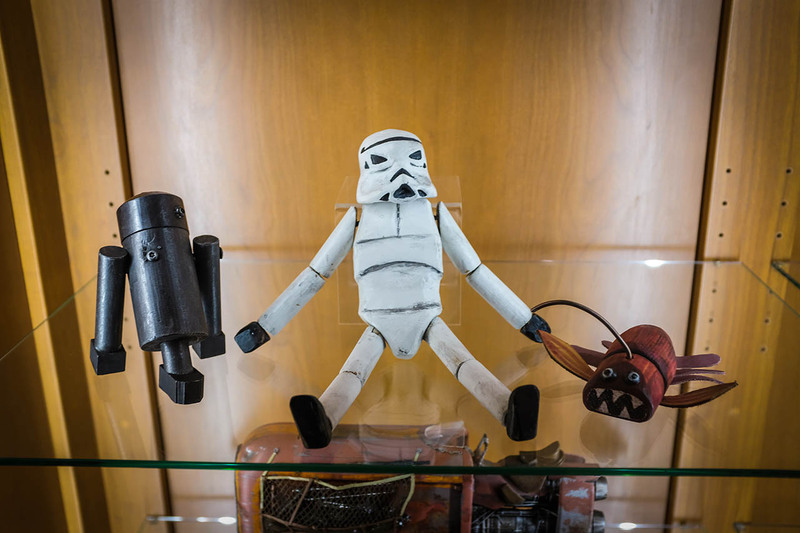 Voting closes at 11:59 p.m. PST tonight, which gives you just a few more hours to let your voice be heard in the judging of this year’s finest Star Wars fan-made creations. Our panel of judges has narrowed it down to the best of the best, and we need your help to make the final call over at StarWarsFanAwards.com. The entries with the most votes will win the coveted Audience Choice award in the genres of Long Video (up to 5 minutes long), Short Video (up to 15 seconds long), Photography, and Visual Art. Remember to check back in December when the full list of winners, including those chosen by a panel of Lucasfilm judges, will be announced in a special episode of The Star Wars Show! An expansion of the Star Wars Fan Film Awards, a longstanding Lucasfilm tradition, the Star Wars Fan Awards are here to celebrate the unique talents in the Star Wars fan galaxy. StarWars.com All Star Wars all the time. 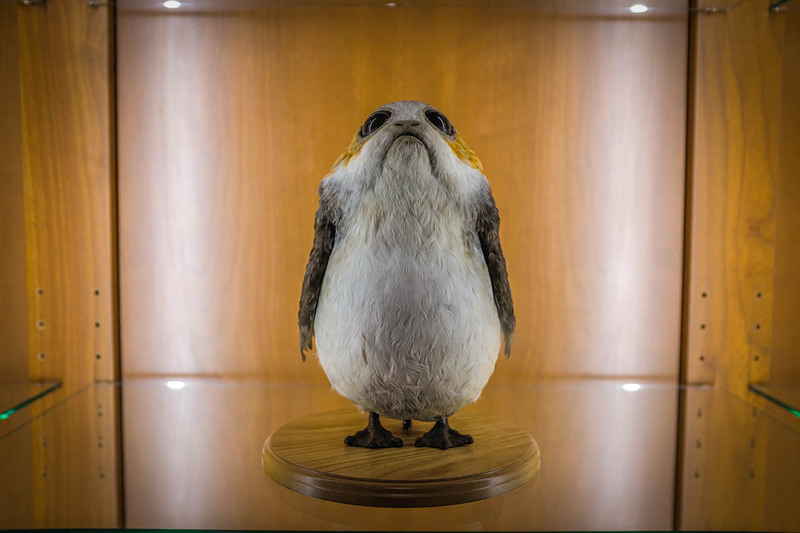 Lucky visitors to the halls of Lucasfilm can now get a closer look at the touch-ably soft downy feathers of a screen-used porg puppet and other props from the most recent Star Wars films. 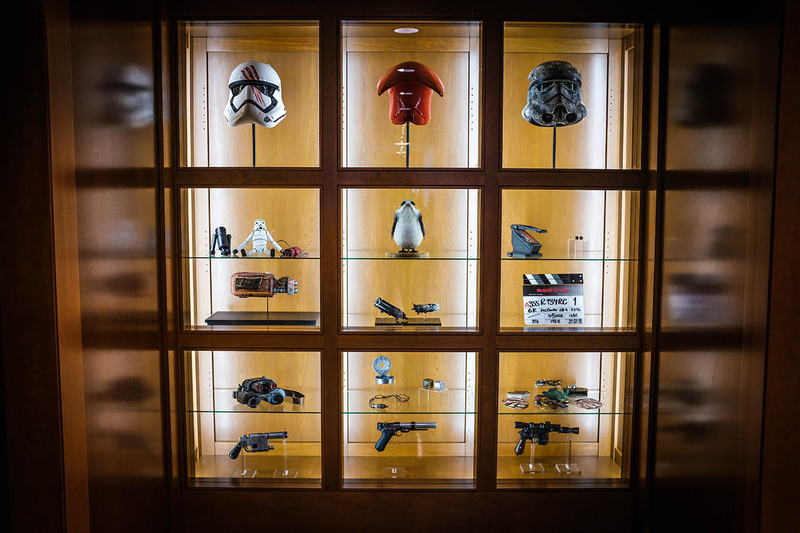 But for those who can’t make it to San Francisco, this week the excitable hosts of The Star Wars Show make a mad dash down the hall from our converted copy room recording studio to give you a glimpse at the glorious pieces. “We made these selections from our new films to showcase the breadth and incredible craftsmanship of our Costume, Props, and Creature FX departments,” says Collections & Exhibitions Archivist Madlyn Burkert. 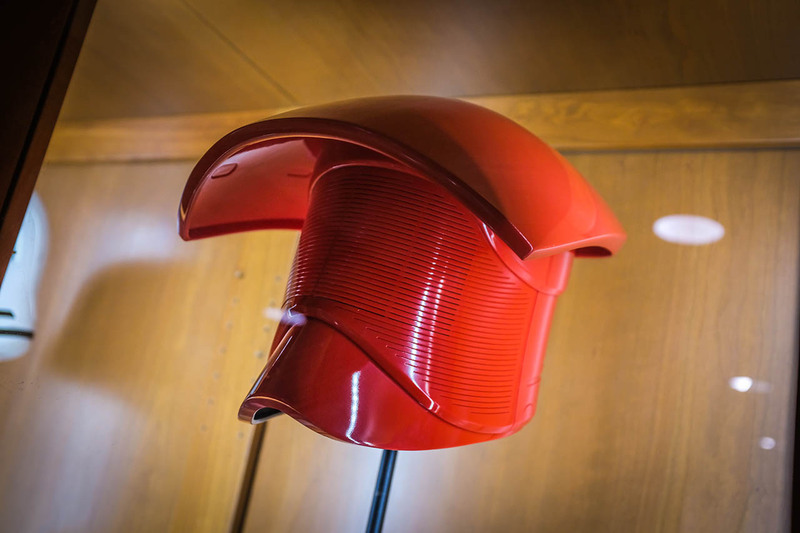 • Finn’s bloodied First Order bucket and a Praetorian Guard helmet, from The Force Awakens and The Last Jedi. 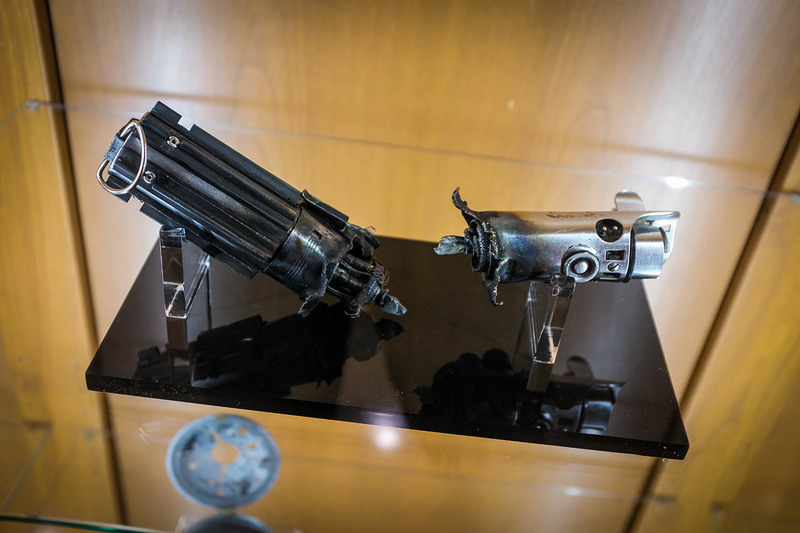 • The blaster Han Solo gives to Rey in The Force Awakens and the broken lightsaber from The Last Jedi. • Jyn Erso’s collection of wooden toys, including Stormie, as seen in Rogue One: A Star Wars Story. • The card reader from Han’s enlistment in Solo: A Star Wars Story. It’s time for you to see some amazing fan-made creations in the Star Wars Fan Awards 2018 — and weigh in with your picks for the Audience Choice awards. Our panel of judges has narrowed down thousands of inspiring, heartfelt, and truly impressive entries, but we need your help to decide the next phase in the Star Wars Fan Awards 2018! Now through November 13, head over to StarWarsFanAwards.com and cast your ballots. Four winners will be chosen by the fans in the genres of video, both long form and short form, photo, and visual art, and take home the coveted Audience Choice award. Come back once a day, every day, through November 13 to vote. Then get ready for the full list of category winners, chosen by a panel of Lucasfilm judges, to be announced in December with a special episode of The Star Wars Show!